See what our customers are saying: : Click here to see them! Order Yours Now for Only $2,695.00 and receive Free Promotional Shipping Today! A recumbent electric tricycle is an electric tricycle that places the rider in a laid-back reclining position. Most recumbent riders choose this type of design for ergonomic reasons; the rider's weight is distributed comfortably over a larger area, supported by back and buttocks. On a traditional upright tricycle, the body weight rests entirely on a small portion of the sitting bones, the feet, and the hands. Most recumbent models also have an aerodynamic advantage; the reclined, legs-forward position of the rider's body presents a smaller frontal profile. Shock absorbing system for a super smooth ride. 36 Volt electronic system generates 550Watts power in the rear hub. Others have the 12 or24 Volts system with a lot less power and efficiency. NEW! You can choose the PowerBooster to get the 1500 Watts Power for only $289.50! This option can be added on the order page. It cannot be added to your trike after it has been shipped. How much does it cost to charge your etrike? In what colors do they come? What if my battery dies while I am on a longer ride from my home? Nothing special as you can use the trike as a regular tricycle to pedal home. Does the trike have throttle for speed variation? Yes, it does. It means that you can ride as slow as you want or as fast as about 26 m/h. Are the distance per charge and the speed of the trike firm? 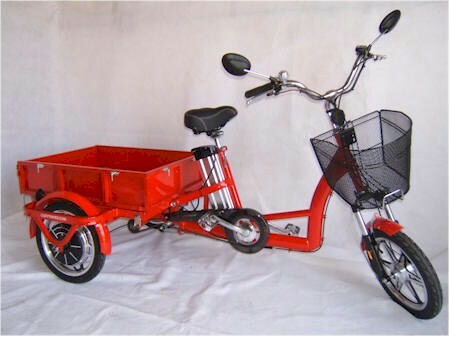 Yes, you can attach any trailer to the back of this amazing tricycle.